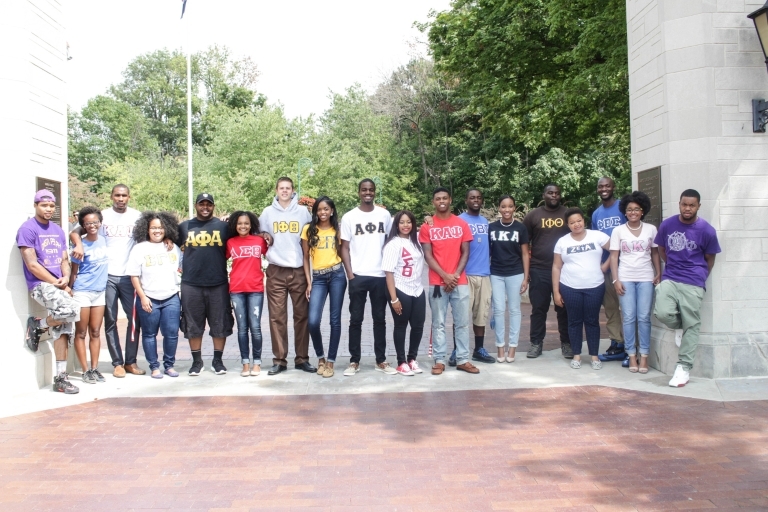 Indiana University Bloomington will honor its historically black fraternities and sororities in a public celebration at 11 a.m. Friday, April 21, outside the Neal-Marshall Black Culture Center. A permanent row of limestone markers or "plots" bearing the names of America's nine original black Greek chapters -- known as the "Divine Nine" -- are arranged in an arc along the sidewalk that leads to the entrance of the Neal-Marshall building. A 10th plot represents the National Pan-Hellenic Council Inc., a collaborative of the nine chapters that was founded at Howard University in 1930. James Wimbush, IU's vice president for diversity, equity and multicultural affairs, said the reason for use of the term "plots" in commemorating the Divine Nine on U.S. campuses traces back to post-Civil War times, when formerly enslaved African-American farmers were promised 40-acre plots for homestead development. "Today, these plots serve as a powerful symbolic and physical reminder of the strength and resilience shown by the founders and members of these groups," Wimbush said. "The legacies of these fraternities and sororities -- which continue to elevate our campus through their scholarship and service missions -- have helped shape student life as we know it today. I hope those who pass by this space will see it as a place for both reflection and celebration." For more than 10 years -- and through 224 individual donations -- project organizers have raised money for the markers. Final funding to make the plots a reality came from the Office of the Provost and Executive Vice President. "The Divine Nine plots line a path leading to the Neal-Marshall Black Culture Center, which was designed initially as a 'home away from home' for the African-American community on this campus," IU Bloomington Provost and Executive Vice President Lauren Robel said. "This center has become an integral and inclusive space for programming, instruction and collaboration. "Part of Indiana University's mission during the years leading up to our bicentennial in 2020 is to honor all of the communities that have helped make our university the thriving, diverse place it is today, and we are grateful to those who paved the way for today's student success." The plots are placed in order of when they received their charter at IU. Eight of the nine currently have active chapters at IU, and all have had a presence on the IU Bloomington campus. Kappa Alpha Psi Fraternity Inc., founded at Indiana University on Jan. 5, 1911; Alpha Chapter chartered at IU on May 15, 1911. Alpha Kappa Alpha Sorority Inc., founded at Howard University on Jan. 15, 1908; Tau Chapter chartered at IU on Dec. 16, 1922. Alpha Phi Alpha Fraternity Inc., founded at Cornell University on Dec. 4, 1906; Gamma Eta Chapter chartered at IU on Sept. 11, 1947. Omega Psi Phi Fraternity Inc., founded at Howard University on Nov. 17, 1911; Zeta Epsilon Chapter chartered at IU on Oct. 20, 1947. Delta Sigma Theta Sorority Inc., founded at Howard University on Jan. 13, 1913; Gamma Nu Chapter chartered at IU on Nov. 8, 1947. Sigma Gamma Rho Sorority Inc., founded at Butler University on Nov. 12, 1922; Epsilon Chi Chapter chartered at IU on Oct. 18, 1971. Phi Beta Sigma Fraternity Inc., founded at Howard University on Jan. 9, 1914; Epsilon Iota Chapter chartered at IU on Jan. 3, 1972. Zeta Phi Beta Sorority Inc., founded at Howard University on Jan. 16, 1920; Delta Epsilon Chapter chartered at IU on April 23, 1973. Iota Phi Theta Fraternity Inc., founded at Morgan State University on Sept. 19, 1963; Gamma Delta Chapter founded at IU on Nov. 19, 1995. Lori Reesor, vice provost for student affairs and dean of students, said she is impressed by the work of the students, alumni, parents and others who made it possible for the university to honor the Divine Nine. "It is meaningful to see this important homage come to fruition," Reesor said. "Everyone who comes to our campus can celebrate the organizations that form the National Pan-Hellenic Council, whose guiding principles promote unity, foster leadership development and set a high standard of scholarship and service -- principles to which all IU students should aspire." IU senior Devon S. Brown, an officer in Kappa Alpha Psi and president of the National Pan-Hellenic Council, will take part in the ceremony by unveiling the first plot. Brown, who grew up in a small family with a single mom, came to IU knowing he wanted to join a fraternity for the brotherhood and fellowship. Despite a busy schedule filled with classes, a consultant supervisor job at University Information Technology Services and a graphic design internship for the IU football team, he always finds time for his fraternity brothers and all of his Greek life peers. "Since becoming president of the NPHC, the main highlight for me has been the plots," Brown said. Brown, who will graduate in December with a degree from the School of Art and Design, is gratified to know that each time he comes back to visit IU, he can spend time in the space where the Divine Nine markers tell an important part of the university's story. "IU was one of the few non-historically black colleges and universities where a Divine Nine organization was founded," he said. "The plots are important not only to the Divine Nine but to Indiana University as well."